Aluminum foams made by 6063 aluminum alloy have been prepared by melt foaming method. The uniformity of foam pores is much concerned for that homogeneous pores attribute to excellent properties. It is mainly up to the stirring intensity when adding the blowing agent into the melt, and the cooling rate of the liquid foams. 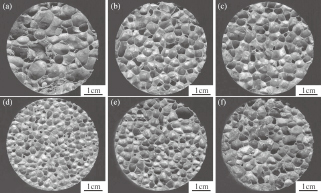 In this paper, 6063 aluminum foams have been fabricated by different stirring times of TiH2 at different cooling conditions. Microstructure, cell size uniformity and compressive property of the foams have been studied. The melt which mechanically stirred for 6 minutes before foaming and the foam cooled in the air show homogenous pore structure and good mechanical property. The use of 6063 aluminum alloy offers a new raw material to prepare foams with a uniform cell size distribution as well as good mechanical property.